For several years, the lighting industry has moved aggressively into lighting controls—making a play for the Internet of Things. Yet, unlike the computer industry that is now competing to offer home controls, the lighting industry has been slow to advocate for cradle-to-cradle sustainability. As part of our “Build. 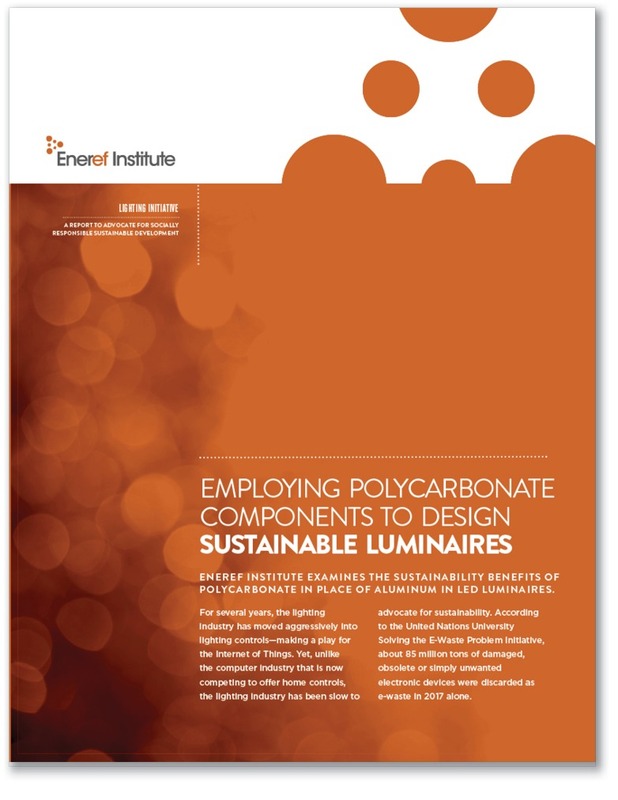 Don’t Burn.” campaign, Eneref Institute examines opportunities to replace metal component parts in LED luminaires with polycarbonate, with the overarching goal of reducing the environmental footprint of the lighting industry. While no panacea, drilling for petrochemical hydrocarbons—the raw material of plastics—is far less destructive to the environment than mining for aluminum. Metal mining is linked to water contamination, deforestation, and environmental degradation, as well as conflict and violence due to land grabbing. All extracted coal, oil, and natural gas is usable for making plastic, whereas the only small percentage of mined ore can be used to make aluminum. Of the millions of tons of ore processed every year, over 95% is disposed of as waste.